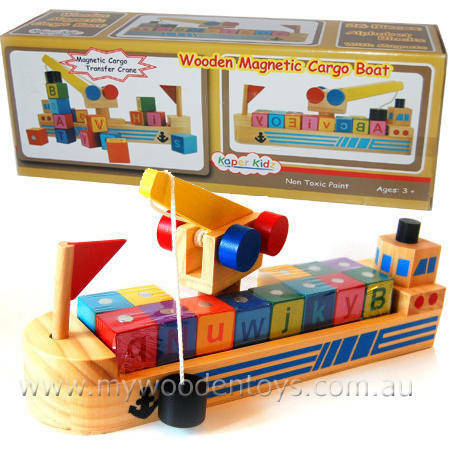 Magnetic Alphabet Block Cargo Boat is a sturdy well designed wooden ship with a magnetic crane and 26 alphabet blocks. This cargo ship has a working crane which can pick up the blocks. The blocks have metal studs and the crane has a magnet at the end of the string. The crane can also turn and the string wind up and down so the blocks can be loaded and unloaded from the hull of the ship. The 26 blocks all have letters of the alphabet in upper and lower case on them so there are many learning possibilities as the toy is played with eg "Can you load the alphabet in order." or "try to pick up the letter b." The crane is also removable from the hull of the ship for extra play opportunities. Size: 33cm long x 8cm wide. Crane is 22cm high. We Like this because: "Very well though out and as with all good toys learning and play blurs into one."